Sometimes clients hire an architect knowing exactly what they want in a building, but that is rarely the case. We believe most clients come to an architect so they can be informed of the options that exist for a particular decision, along with the costs and benefits of those choices. When it comes to long-term energy expenses, one of the most critical design decisions is the selection of mechanical systems and lighting. Whether or not a client mentions an interest in geothermal HVAC (heating, ventilation and air conditioning) or LED (light emitting diode) lighting, they are usually concerned with the what the utility bill will be. Because of this, we have frequently worked with the mechanical engineers on a project to prepare estimated pay back time on the increased upfront costs for these technologies, which are becoming increasingly efficient and affordable. Many times, clients that were not originally interested in, or aware of, geothermal HVAC or LED lighting, have opted to include them in their buildings for both economic and environmental reasons. 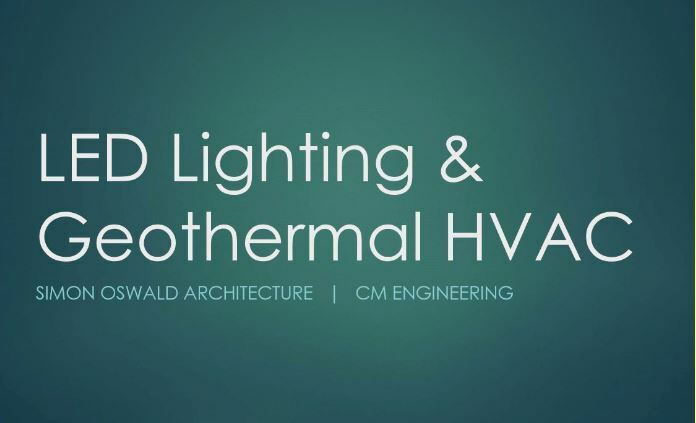 The PDF below is a presentation that SOA created for a client “Lunch and Learn,” which shows several SOA projects with geothermal HVAC and LED lighting, along with their utility usage data as compared to buildings with conventional mechanical and lighting systems. Sharing this information, along with energy consumption projections tailored to a client’s specific building, truly enables clients to make an informed decision.